Water views, park, markets and loads of Christmas cheer! 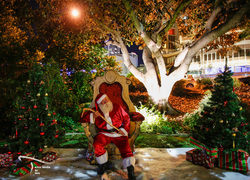 The Christmas Markets GC at the Broadwater Parklands are on again from the 18th December to the 20th December 2015. Take a break from the hustle and bustle of shopping centres, irate drivers and car parking spaces and come to a place where you can enjoy the atmosphere and just chill. Take time out and just relax with friends and family as you wander through the markets. Aah…awaken your senses with the aroma of beautiful Christmas pine trees and delight in the vision of sparkling, shimmering lights. And, who doesn't like a market, take the stress out of giving with market stalls filled with delicious Christmas treats, toys and unique gifts. And, who knows… Santa may just be hiding somewhere in between the Christmas trees! Afterwards, breathe in some fresh air and take a stroll through the parklands. I am always amazed how peaceful it is at night looking out to the water. Something here for everyone, couples, families or just you. And best of all, it's FREE to come along! When: Friday, Saturday and Sunday 18th-20th December 2015 4.00 p.m. to 10.00 p.m.